Today we took 41 shoe boxes to St Aidan's to be collected and taken to children in Romania, Zimbabwe, Kenya, Uganda and various African countries. Even though some of these countries are hot, we have been reliably informed that the children love receiving hats and gloves as it does get cold of a night. They also enjoy the hats and gloves as they use them as a fashion statement. These children will only receive a shoe boxes this Christmas. Please remember them though out Advent. We also took 20 cardigans knitted by Brenda Wusteman - thank you. Also we took a bag of crayons and soft toys all of which have been donated. In total £180.00 was collected of which £87.00 was gifted aided. £80.00 of this grand total was donated to us via Fran. 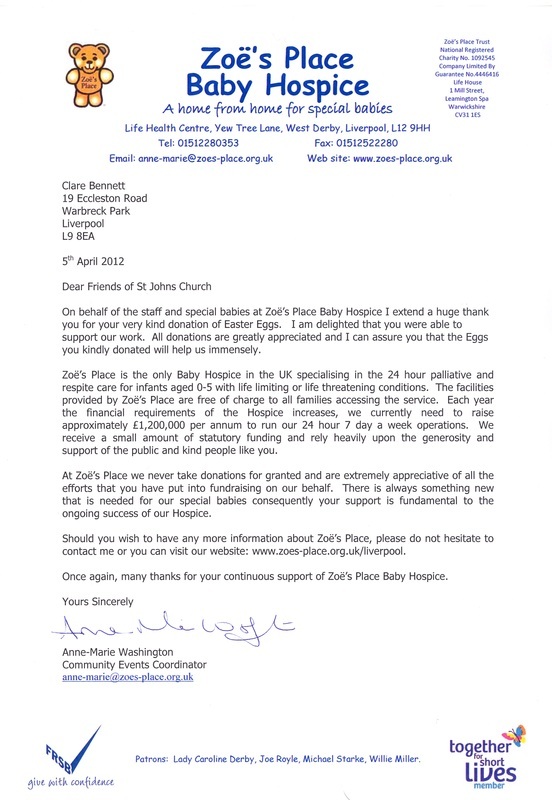 He obtain this donation through one of his many contacts - thank you. As always, many thanks to all who have helped and supported this amazing appeal. 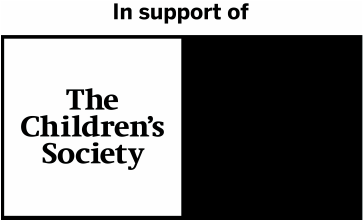 In 2009, the congregation supported the National Society for the Prevention of Cruelty to Children by buying extra Easter Eggs over and above what they bought for their relatives and friends. This amazing amount of eggs was delivered to the local centre on Great Homer Street who were extremely grateful. 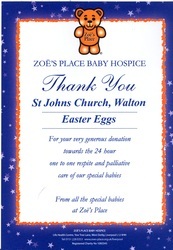 We have just delivered over 50 eggs from the congregation and our friends at Archbishop Blanch School. Thank You! 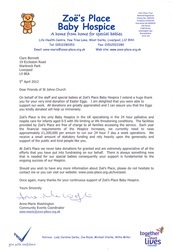 .....saw the delivery of another 60 eggs between St. John's and Archbishop Blanch School. Thank You all once again! Marj Symes is the co-ordinator at St. John’s for Christian Aid. They are a Christian organisation that insists that the world can and must be swiftly changed to one where everyone can live a full life, free from poverty. They work globally for profound change that eradicates the causes of poverty, striving to achieve equality, dignity and freedom for all, regardless of faith or nationality. They are part of a wider movement for social justice. They also provide urgent, practical and effective assistance where need is great, tackling the effects of poverty as well as its root causes. Our annual Christingle service is focused on the work of the Children’s Society. They take action to prevent, rescue and support children facing life trapped in a vicious circle of fear and harm; a vicious circle driven by violence, neglect, poverty and discrimination. Ada Parle co-ordinates the money box collections for this. Comfort Parcels for Troops - This appeal has now finished, Thanks! Jayne Davies has been collecting from members of St. John's for "Comfort Parcels for Troops" who are a Charitable group involved in giving comforts to Servicemen and Women who are currently fighting abroad in Afghanistan or Veterans who have returned from conflicts. Many of the people who receive our parcels never normally receive letters or parcels from anyone because they have no family or perhaps the family they do have are on low incomes and cannot afford to send parcels. THIS HAS NOW FINISHED. THANK YOU SO MUCH FOR YOUR HELP!!!!! Guide Dogs for the Blind - This appeal has now finished, Thanks! The Guide Dogs for the Blind provide mobility and freedom to blind and partially sighted people. They also campaign for the rights of people with visual impairment, educate the public about eye care and fund eye disease research. They have been expertly breeding and training guide dogs for more than 75 years, providing many thousands to blind and partially-sighted people of all ages and from all walks of life. They also deliver confidence-building rehabilitation services to adults, young people and children - including long cane mobility training and communication and daily living skills. A member of staff at Rice Lane is collecting Tin Foil for the Guide Dogs. Please leave your tin foil in bags with Michael Bennett and he will ensure this reaches the school.